Haiti has come to the front of the international news after the earthquake that took place in January this year and caused more than 200,000 deaths. Another issue also called the attention of the world: the situation of the child serfs and the trafficking of minors. The Restavèks are unpaid child servants living and working away from home. In principle, parental placement of a restavèk child involves the handover of childrearing responsibility to another household in exchange for the child’s unpaid domestic service. Restavèk placement is generally viewed as a long term arrangement that may last for several years. The traditional expectation is that the “caretaker” household will cover the cost of sending the restavèk child to school. The Créole term restavèk literally means someone who lives with another (“reste avec” in French). In some cases, outside children are treated almost as if they were informally adopted, but often they are treated very badly, virtually as slaves. The exploitation of children in domestic service is compounded by economic hardship in Haiti, with many of the receiving families living in poverty themselves. Over half of the population lives below the $1-a-day poverty line, and 76 per cent live on less than $2 a day. The UN Special Rapporteur on Contemporary Forms of Slavery, its Causes and Consequences, Gulnara Shahinian, expressed deep concern over the highly exploitative nature of the ‘restavèk’ system in Haiti, which she considers to be a modern form of slavery. The restavèk system, often deprives children of their family environment and violates their most basic rights such as the rights to education, health, and food as well as subjecting them to multiple forms of abuse including economic exploitation, sexual violence and corporal punishment. 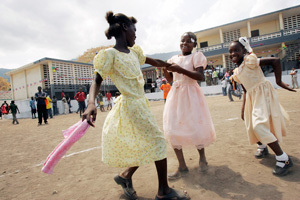 According to different studies, child domestic workers in Haiti number between 170,000 and 230,000, which represents around 10 per cent of the child population aged between 5 and 17. About two-thirds of the child domestic-helpers are girls and they are mostly found in rural areas. There is a tendency for male restavèks to originate from rural areas, whereas girls tend to come from urban areas. As restavèk teens get older, they are commonly tossed to the street to fend for themselves and become victims of other types of abuse and social exclusion. According to a study by The Lancet, the rate of sexual assault against female restaveks is almost four and a half times greater than that for girls who are not restavèks. Of the female restavèks, one in 19 are sexually assaulted per year, compared with one in 84 girls who are not restavèks. Recently the direct placement of children from family to family has been supplemented by the existence of recruiters, who for financial gain recruit children from rural areas to work in urban families as child slaves in domestic work. In addition, the majority of the demand has shifted from wealthy families to poorer ones. Many children have been reported as trafficked both within and outside the country. These abuses happen irrespective of the fact that Haiti has ratified many international human rights instruments on the elimination of slavery and the protection of the rights of the child, in particular the UN Supplementary Convention on the Abolition of Slavery, the Slave trade and Practices similar to Slavery, the ILO Convention No. 29 on Forced or Compulsory Labour, the Convention on the Rights of the Child, the Convention on the Elimination of All Forms of Discrimination against Women, the International Covenant on Civil and Political Rights, and ILO Convention No. 182 on the Worst Forms of Child Labour and the UN Convention on Transnational organized Crime and Protocols. Haiti should still ratify the International Covenant on Economic, Social and Cultural rights and the International Convention on the Protection of the Rights of All Migrant Workers and Members of their Families. The Government of Haiti should also take urgent measures to bring local legislation into conformity with ratified international legal instruments; adopt a law on the fight against trafficking in human beings; and develop strong mechanisms for child adoption. The earthquake in Haiti has left thousands of children dependent on assistance from people with whom they have previously had no contact. While the majority of people offering assistance following the Haiti earthquake will be committed to improving the lives of the children who have survived, these types of situations also attract individuals and organised criminal syndicates seeking to gain access to possible victims who are vulnerable and easy to exploit. According to Interpol, there are concerns over increased offers of international adoption, as there are known links between this market and child trafficking and exploitation networks. Moreover, many children resident in orphanages are not true orphans. There is an international adoption circuit that operates in Haiti, and this circuit is built in part on the role of orphanages as assembly points for children available for adoption. Given the relative affluence of foreign parents seeking children, the situation is rife with the potential for corruption and maneuvers that may not be in the best interest of the children. According to one child protection group in Haiti, since the earthquake more than 7,300 boys and girls have been smuggled out of their homeland to the Dominican Republic by traffickers profiting on the hunger and desperation of Haitian children and their families. In 2009, the figure was 950. There was a scandal when an Evangelical group from Idaho tried to take 33 children from Haiti to an orphanage in the Dominican Republic in February, but one month later, smugglers moved 1,411 children out of the country without attracting much attention. The buscones, as the smugglers are known, not only deliver children on request, they also deliver them on demand to strangers. Two UN studies in 2002 and 2004 demonstrated that even in the past Haitian and Dominican traffickers have operated with impunity and taken advantage of the complicity of the border authorities in both countries. The earthquake created a mass exodus, which makes it hard at times to differentiate between smugglers and parents or relatives crossing the border with children. Some of these minors are now offering their sexual services to affluent foreigners in tourist resorts on the western part of the Island. A zero-tolerance policy against traffickers has to be effectively implemented so as to stop thousands of children becoming victims of their crimes and bring them to justice. The main driver of child servitude and child trafficking is the extreme poverty reigning in Haitian society. The solution to this problem should be based on the provision of development aid and the establishment of educational institutions, social protection networks, family policies, and the strengthening of the rule of law. However, in spite of the sums pledged by the international community to rebuild the country after the earthquake there is still much to be done to guarantee a future for the country and real support for its people. The tradition of the restavèk, which was born traditionally as a way to provide an education to poor rural children, has become today a method of exploitation of child labour or even a source for the worst kinds of slavery and human trafficking. With all the funds pledged to Haiti after the 2010 earthquake it is difficult to justify not addressing the problem of the restavèk through measures such as the creation of rural schools, the improvement of the income of the poorest families, or the prosecution of traffickers. It would be good to include in the Millenium Development Goals for 2015 the elimination of the practice of the restavèk in Haiti. Daniel Ruiz is a researcher in Peace and Transnational Organized Crime, and has taken part as a relief operator in the reconstruction effort following the January 2010 earthquake in Haiti.